Currently, the Prevent Drowning Foundation offers free swimming and aquatic safety lessons to kids and schools in underprivileged parts of San Diego. 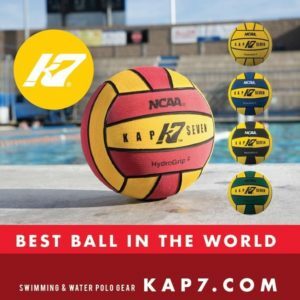 After dropping out of the Top 25 into the ranks of the vote getters, San Diego State pulled off a pair of upsets amidst a 2-1 effort on water polo Week 9. #15 Long Beach State’s Sarah Barker recorded five goals in a 13-7 win over #16 Wagner on Sunday and added four more in a 15-6 victory over RV Bucknell on Thursday. Barker was one of 24 players with at least one four-goal effort on Week 8. The Urbana University Department of Athletics announced it will add two sports with the revival of women’s lacrosse and the addition of women’s water polo. Both the men and women’s FINA Water Polo World League Intercontinental-Cups are set to kick-off in Perth, Australia, next week from March 26-31, with sixteen (2x eight) teams that will battle it out in the pool to hopefully secure a berth to the Super Final. With just a handful of upsets on Week 8, it is no surprise that there weren’t many major moves in the Week 9 CWPA Top 25 rankings. The Top 13 remained in tact. Bucknell moved back into the poll, while Princeton dropped three spots to #17. In a week that featured 21 matches between ranked teams and four Top 10 affairs, there were just three upsets. San Jose State was involved in all three upsets, topping Princeton, but falling to Marist and Bucknell. Olympiacos won the thrilling battle of the champions so the title-holders earned a 3-point lead ahead Szolnok and that might be the end for the 2017 champions from Hungary. USA Water Polo National Team athletes delivered 904 items of new clothing to Village of Hope at Orange County Rescue Mission. Wherever Stanford’s #11 Makenzie Fischer is in the pool opposing coaches and players take notice. But, the question remains, even if they know where she is, can they stop the Cardinal’s goal scoring machine. All eyes are on Piraeus where the title-holder Olympiacos Piraeus (GRE) and the 2017 champion Szolnok (HUN) clash in a match which might turn out to be a live-or-die encounter. In a record setting 23-2 win over Wittenberg, three Indiana Hoosiers turned in three or more goals led by Tina Doherty and Hannah Falls-Hand, who posted six goals apiece to lead the Week 7 standout performances. Week 8 women’s water polo action includes 21 matches between ranked teams beginning on Thursday, with nine coming at the LMU Invitational in Los Angeles.